Factory Sealed 2013 Topps Finest Football Hobby Box NFL mit 2 Mini-Boxes Per Master Box, 6 Packs Per Mini-Box, 5 Cards Per Pack. 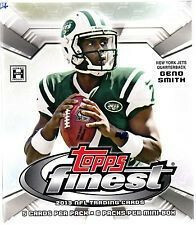 Produktinformationen "2013 Topps Finest Football Hobby Box NFL"
2013 Topps Finest Football will also feature more ON-CARD autograph content including Rookie Refractor Autographed Variation Base Cards and Finest Atomic Refractor Rookie Autographed Cards! Key Rookies: Matt Barkley, Ryan Nassib, Tavon Austin, Geno Smith, Dion Jordan, Barkevious Mingo, Tyler Eifert, DeAndre Hopkins, Manti Te'o, E.J. Manuel. AUTOGRAPH PATCH CARDS: 1 per MINI BOX! Up to 40 NFL Rookies featured with a multi-color patch and signature on Finest refractor technology. AUTOGRAPH JUMBO RELIC CARDS: 1 per MINI BOX! Up to 50 Rookie and Veteran NFL players featuring an autograph with a jumbo jersey relic swatch. Up to 20 cards featuring two collectible players with a jersey relic swatch and an autograph from each. Sequentially numbered to 10. Up to 10 cards featuring three collectible players with a jersey relic swatch and an autograph from each. Sequentially numbered to 10. AUTOGRAPH CARDS: At Least 1 Per Case! ON-CARD autograph variations of the base rookie cards! Numbered to 50. Up to 25 veterans and top rookies featuring their autographs and a highlighted performance. INSERT CARDS: 4 Per MASTER BOX! Uncut Sheet Redemptions - Featuring uncut sheets of veteran and rookie base forms including Refractor and X-Fractor parallels. Base Cards: Featuring 50 of the most anticipated NFL rookies and 100 exceptional NFL veterans. Weiterführende Links zu "2013 Topps Finest Football Hobby Box NFL"
Fanbewertungen für "2013 Topps Finest Football Hobby Box NFL"